hey, not bad, actually got some elevation on the big guy. the Akebono one was more like a variation on Kaz Hayashi's old finisher (I think it was the Final Cut?) where he just drives his arm onto the guy's neck while standing. First post has been updated with results. So far the surprise for me is that there are no real surprises. Besides maybe Doering over Akiyama, all the matches have had the way you'd expect. Wonder if they are saving the upsets for later, or I am too used to the G1 Climax which generally always has a few major upsets in the tournament. No, this has actually been an odd tournament with the lack of surprises. Even the Doering win over Akiyama while an upset was an incredibly small. It's not even really an upset. By this point I think Doering has pinfall victories over just about everyone, and he's got the edge over Akiyama both in the youth department and the "never won a Carny before" factor. He drew Go today too. I could totally see him winning...he was Akebono's V1 challenger so it's not like if he won and got the title shot they would be repeating a match that just happened super recently (as opposed to if Go or Miyahara won). They've been doing a lot of booking like this recently. I was so sure Miyahara was winning the Triple Crown just because I felt they would need some sort of surprise "New Hero" factor to catch the fans off guard and create some word-of-mouth interest. Instead they went the Wrestlemania 2000 route and kept the belt on the heel. Surprising us with the lack of surprise...if they weren't doing such poor business I'd say that maybe they were actually on to something novel. .
Eh, there was pretty much no chance in hell Miyahara was winning the Akebono match. Suwama vs Fujita in a balls-out brawl would be my MOTY on paper (so long as Fujita jobbed clean). Akebono is out of all remaining CC matches. I've read that it's a relapse of his pneumonia, but I dunno. Hopefully he can recover in time to wrestle the CC winner; I think they've done a decent job of getting him over as a formidable champ, and it would be a shame if all that build went nowhere. Apparently Go is out with an injury, so all of our predictions are boned. My friend Yuji Tsuruta was going to get us free tickets for the finals in Osaka... but in an amazing bit of news he was just offered the chance to go on the road with AJPW as part of the ring crew. I'm stoked for him, so much so that I don't even mind that I won't be getting free tickets for the show now. I was looking forward to seeing Zeus (and Bodyguard, who might be getting a singles match now because of the injury/illness situation) backstage, since I haven't seen them for a couple of months and since I think it would have blown their minds to see me back there... but there will be other opportunities for me to make some new stories to tell. This opportunity for Yuji might be a once-in-a-lifetime bit of perfect timing. As I said, I'm really happy for him. Can you see the resemblance to his father? So I assume they are still hoping to get him to join AJPW then? So how long until AJ books Gordi? Also kinda shocking: they drew nearly 3000 people. Definitely surprised that Omori won, but with two of their biggest stars injured late in the tournament I can't hold it against them. I am sure that originally Akebono or Shiozaki were winning (or at least in the Finals) so I am sure they had to do some last minute rewrites. Assuming Akebono gets healthy though, Omori is no threat whatsoever to the Triple Crown, he will just be another easy conquest. I'm too lazy to do the points from here at the moment (will do it when I am off tomorrow), but I should point out I got 0 points. I'm awesome. I like this result a lot. I've always had a soft spot for Omori so finally winning the CC against a former AJPW rival sits well with me. I wouldn't write him off as a transitional champ until Go comes back, if for no other reason than as a 'thanks' nod for staying with the company after the W-1 split (not that Mutoh probably wanted him all that bad anyway). As was pointed out, they were in a tough spot with Go and Bono both getting hurt/sick so kudos for going with a surprising sentimental choice. 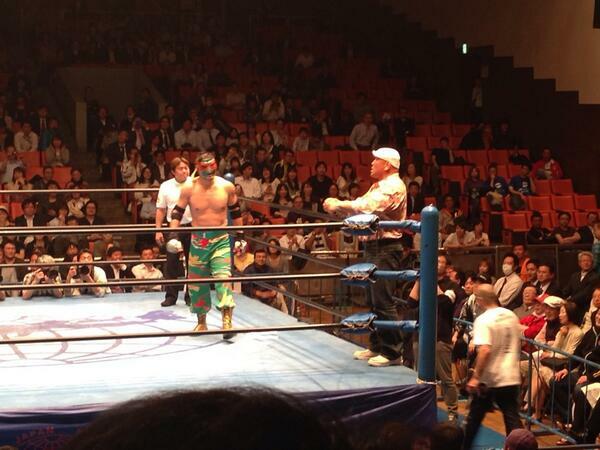 Him and Akiyama always work well together so hopefully the crowd dug it.